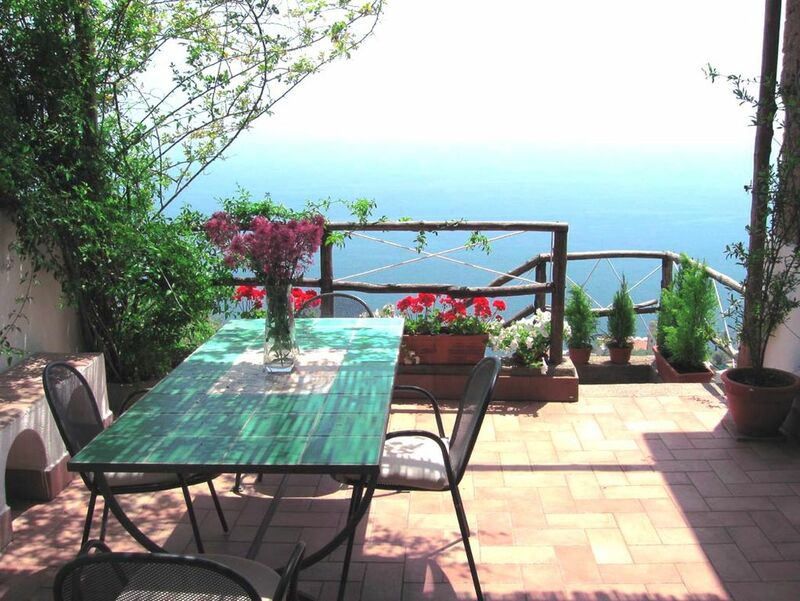 Wonderful Seaside House On The Amalfi Coast – Enjoy The Terrace & Sea View! The House is located in Conca dei Marini, a Cozy and characteristic town on the Amalfi Coast. The town is 5 Km far from Amalfi, 10 km far from Ravello and 15 Km far from Positano, three of the most important touristic sites of South Italy. You can easily reach those sites by Bus if you are not renting a car. Also , in the town, there is a company providing a shuttle service everywhere on the Amalfi Coast at any time. They also rent Scooters. From Amalfi you can easily reach Capri Island by a Fast Boat service and Sorrento by Bus (or by boat as well). There are also many tour operators which organize half-day trips to Ravello , Pompei and Vesuvio. If you are renting a car you can reach Pompei or Sorrento in about 1 hour. There are many nice beaches in the area. In Conca dei Marini there is a very nice marina with a lovely small beach , a bar and 3 restaurants just above the sea. The house is built on 2 levels. On the first floor there is a living room , a kitchen and a bathroom with a shower. There is also a terrace with a stunning sea view! On the mezzanine there is a double bedroom with a private bathroom and a sleeping area with a double bed separated from the other bedroom by an open corridor with 2 french screens. In the living room there is a large and comfortable sofa bed, so up to 6 people can sleep in the house. Towels and Bed Linen are provided! Five minutes walking from local shops, supermarket, restaurant , bar and bus stop. Please remember to bring your own beach towels as these are not provided!! Unlike many houses on the Amalfi Coast which are accessible only by walking up or down many steps , our property is just on the street. You only need to walk up 20 steps to reach the entrance. So is very convenient and suitable also for the Children and the seniors. Our House is fully authorized to be rented to tourists as we have a licence issued by the Town hall. This licence is an important warranty for you as is released upon strict structure, hygienic and fire prevention controls!!! My name is Stefano, I am from Pompei and I am 39 years old. I have a bachelor degree in International Management and I currently live in Florida with my family. As we do not have too much time to enjoy this beautiful house on the Amalfi Coast we are renting it out! The house is very cozy and welcoming. You will feel like at home. It`s Tastefully decorated , very peaceful and from the terrace you have a stunning view of the sea. It`s very well equipped and all the appliances are pretty new and funcional. I am sure you will love it! Ideally located to visit the most important towns of the Coast such as Amalfi , Ravello , Positano, Sorrento and Capri! Unlike many houses on the Amalfi Coast which are accesible only by walking up or down so many steps , our propery is just above the main street. You only need to walk up 20 steps to reach the entrance. So is very convenient and suitable also for the Children and the seniors. Our House has an 'Official Licence' provided by the Town Hall to be rented to Tourists. This license is an important warranty for you as is released upon strict hygienic and fire prevention controls!!! Heating is optional, but recommended between mid November and late March. The heating fee is 10 £ x day or 50 £ x week. You can park the car in the public parking areas belove the house. I will provide you a parking permit which will allow you to park the car everywhere in the town during your staying! My wife and I rented this house on short notice for three nights in April. The drive from Salerno takes about an hour depending on the time of day. We found the house easily enough and were able to park right out front so we didn’t need a parking pass. As Stefano lives elsewhere his representative (Fiorenzo) gave us the key and showed us the house. The house, while small, was perfectly adequate for us. It is pretty much as represented on HomeAway. It counts for a lot that the climb up the from the road on stone steps is a short one since everything on the Amalfi coast is built into the mountainsides. You go up or down. Conca dei Marini is a charming little town. The views from the house and terrace of the sea and the town below are pretty stunning. A little less than a kilometer down the road is an excellent restaurant, La Bonta del Capo, highly recommended, and right next to it is a little market for your groceries. Fiorenzo is also the chef at the above mentioned restaurant. He is most charming and accommodating. Beyond all this the house features a lovely terrace, a living room with fireplace (and gas heat), a kitchen with sink, refrigerator and a stove (you may have to light it with a match). It also has a full working bath on the first floor and a 1/2 bath off the loft bedroom with a very comfortable mattress. The house was very clean and comfortable. It was excellent value. Wonderful of you and very nice, helpful owners. We really enjoyed our stay. The apartment photos look pretty much like it is but it's very tired and worn with a lot of deferred maintenance. The view from that high up is fantastic. The local management is the best we have ever experienced. Also, even though it's true that it's only 20 or so steps from the street, in fact the street is very far from the beach. To walk down to the beach is over 800 or more steep steps. The inexpensive shuttle to the closest beach area runs only three times on the hour in the morning with no returns until the afternoon, and no shuttles down in the afternoon, only three returning on the hour in the afternoons, and 5:00 is the last one. There is a free shuttle to a beach that you have to pay to be at, so you're still paying. There is no place to park down there so driving is not an option. Once you get to the beach area, it's still a hundred or more steps the rest of the way to the beach. So it's important to know that it's beautiful but not a seaside house. It's a sea view house but nowhere near seaside. Once you get to the sea, though, it's magnificent and Conca dei Marini is one of the quaintest and picturesque villages you will find without the high prices and crowds of Amalfi and others. The house is a decent size and the patio area is wonderful. Inside the house is overrun with ants so if you have a problem with that, you should be aware. The management is quick to provide ant spray but the house needs updating, exterminating and sealing of openings to overcome this. It's built on the side of a cliff so we understand that there will be bugs but this was over the top. Everything works fine except internet. The internet is not WiFi, it's wireless from 4G outside the apartment. This is important if you need to be connected as we did for work while there -- it stops working entirely constantly. Also, it's important to note that if you are there when it 's hot, the air conditioner is a wall unit in the downstairs and doesn't reach the upstairs at all. And there are no real windows upstairs to catch a breeze. When it's not hot, it's divine. The restaurants nearby, especially Bonta del Capo, are fantastic. The chef of Bonta is the manager of the apartment and he really couldn't have been more responsive and nice. We would stay in a house he manages anywhere any time. THE WORST HOLIDAY EVER !!!!!! the apartment was full of Ants in every room and on the walls so we could not bring food in we had to eat at the resturant every night ---five people not cheap !!!!!! aircondtion faulty/ only one fan worked in bed rooms!!!! the stair to the apartment where dangerours: no light at night , no hand support three sets of high steps also no one came to change beding or towels! we are very dissapointed for the money paid for this apartment we have been over charged and you have ruined five people's holiday . we have waited a long time for this break never again. I am really sorry to read this review. Ants are a common problem in August in every house on the Amalfi Coast as it gets very hot outside and they move inside. There is nothing to stop them. The A/C just needed to be reset. It took 2 minutes to do that and the fuse for the light on the stair was burnt. You could have contacted Fiorenzo, the house manager and he would have reset the A/C, used some spray for the ants, replaced the fuse and the bedroom fan. You would have had all the problems fixed immediately. I am really sorry you did not have a good time. It is the first time we get a bad review in 5 years. Well situated house, with stunning views. We had a lovely stay. The house was very well situated to allow for touring lots of the amazing, beautiful Amalfi coast. We visited Amalfi itself which is only a short ride away as well as Positano and many of the other beautiful nearby towns and villages. We would definitely recommend the restaurant Le Bonita Del Capo in Conca Dei Marini which is only a 5 minute walk from the house. The food, atmosphere, friendly staff and beautiful views were first class. We had several very good evenings there! Conca Dei Marini is very quiet and peaceful and was a welcome place to come back to after sight seeing during the day. Wonderful place and we look forward to returning again soon. What a wonderful apartment, situated up over the Mediterranean, it was Amalfi coast at its finest. The manager who is an excellent chef and host was wonderful. Very passionate and helpful. He speaks wonderful English and his food was the best we had in Italy. The street has its own butcher and general store. Its own café Pizza and more. We loved it here. The apartment was wonderful. It was what you would expect, we could cook and bath and attend to matters. The veiew from the deck was awesome. You could sit out there for hours. The washer machine was not great but that was about it. It was a total stay 5. The House is located in Conca dei Marini, a very cozy and characteristic town on the Amalfi Coast. You can easily reach those sites by Bus if you are not renting a car. Also , in the town, there is a company providing a shuttle service everywhere on the Amalfi Coast at any time. They also rent Scooters. From Amalfi you can easily reach Capri Island by a Fast Boat service and Sorrento by Bus (or by boat as well). There are also many tour operators which organize half-day trips to Ravello , Pompei and Vesuvio. A boat service is offered at the Marina to reach other beaches.